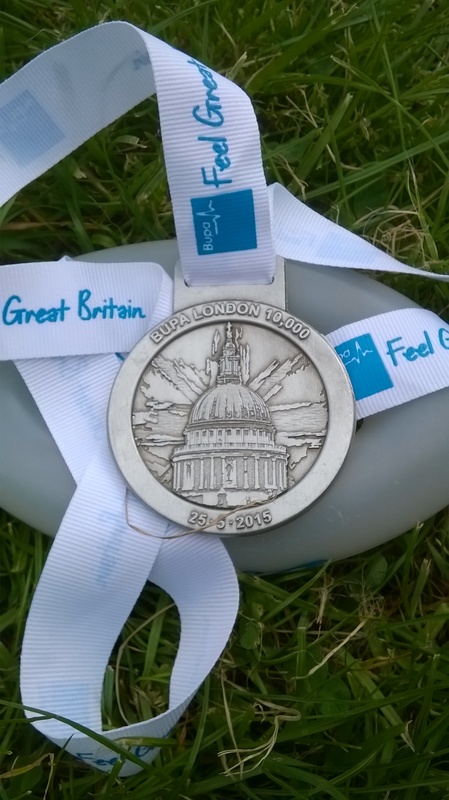 This Bank Holiday Monday I took part in the BUPA London 10000, my fifth year in a row and thankfully my best performance at this event. I would like to suggest this is because I am a fitter athlete (!) but I suspect it is more down to a change in route which made it a bit flatter, thanks to Boris and his super cycle highway which meant Victoria Embankment was out of bounds because of construction works. 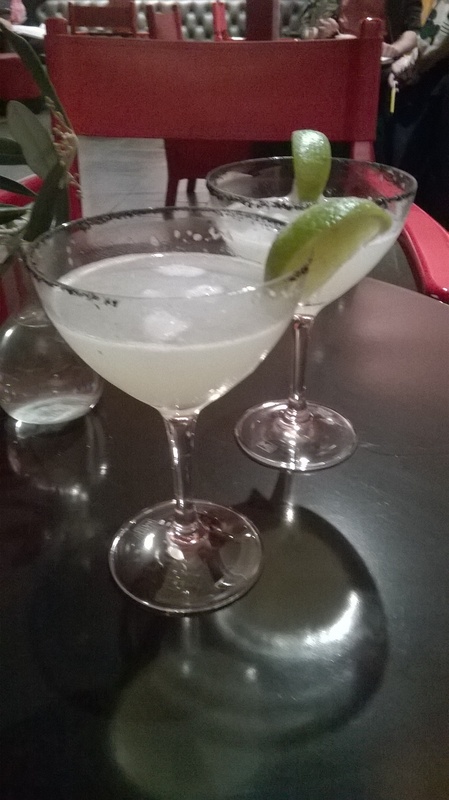 My pre event training wasn’t particularly to be recommended but it didn’t seem to hamper my efforts. 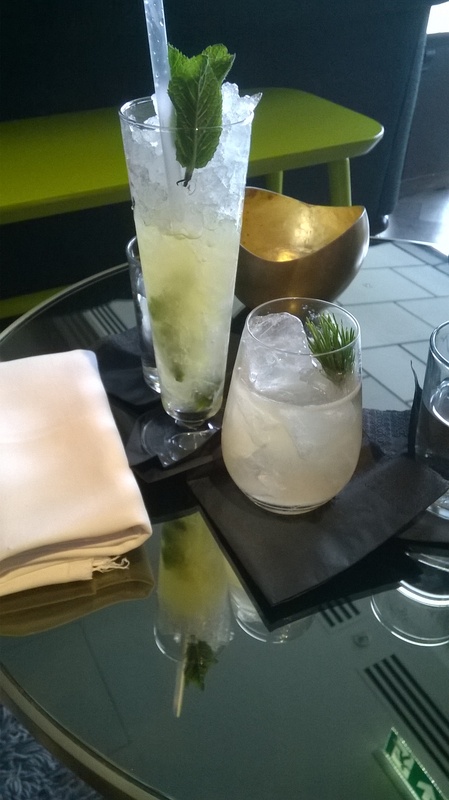 Saturday night’s trip to London involved a lot of alcohol including an Elderfir cocktail which contained a section of fir tree, the “most expensive glass of wine ever” (probably not) and then a slightly cheaper glass of wine, a Riesling called “Kung Fu Girl”. We ended up staying at the Mondrian Hotel on the South Bank, progressing from the ground floor DandeLyan to the 12th floor Rumpus Room. 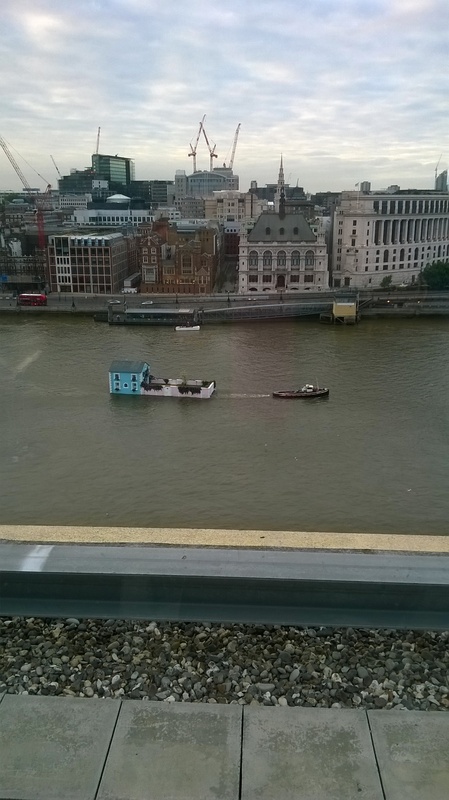 I’m not sure whether it was the copious amounts of alcohol which caused hallucinations but during our time sitting at the outside terrace of the latter, we saw a house being towed down the Thames! 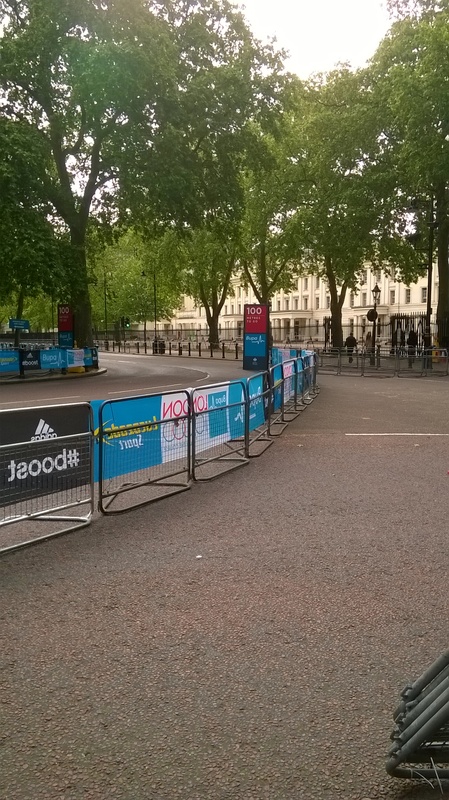 Anyway, enough of my Saturday night shenanigans and back to Monday’s BUPA London 10000. When I received my race pack I was a bit concerned to find myself in the middle of the black wave. Usually I’m in the middle of the green wave, one wave further back. I began to ask myself what predicted time had I put down? Had I been perhaps a teensy weensy little bit over optimistic?! I decided the best option would be to stay at the back of the wave and see what happened, and maybe question some of my fellow runners to see what times they were aiming for. As it happened, I was in a toilet queue with a lady with the same wave race number and I was reassured when she said she’d put down “under an hour”. Okay, could be alright here then. Even so, I still hovered around the back of the wave pack and whilst waiting for the start, I got chatting to another runner. He told me his distance was usually “marathons”. I suggested he might need a change of pace for a 10k then, to which he replied he was going to go hell for leather. 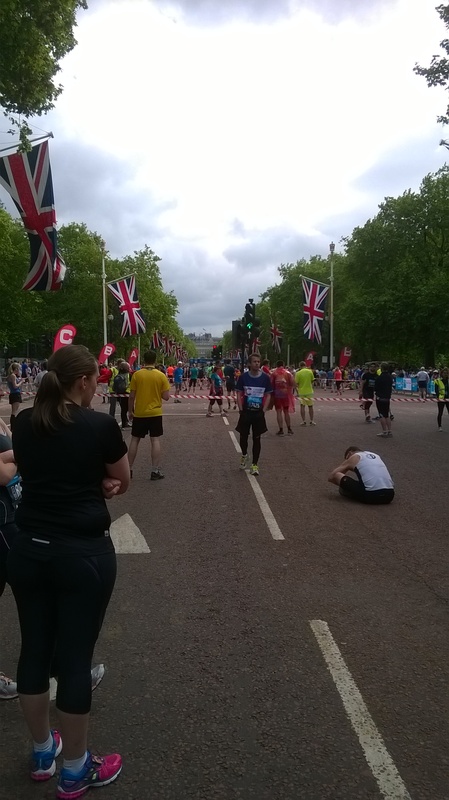 Which is what he did, I saw his baseball cap disappear rapidly into the distance as we moved passed the start line. It was as we came up to the 9k marker on Whitehall that I passed him, huffing and puffing and looking a bit the worse for wear. One half of my brain said I should acknowledge and encourage him on to the finish line. The other half said, “Nah, sod that, I’m on for a good time here” and I moved on quickly before he could recognise me! Mind you, I did also acknowledge that normally that would have been me, going off too fast and then not being able to sustain the pace. Perhaps my plan is beginning to work! This year the course made its way to the City via The Strand, Chancery Lane and Holborn. It was as we ran down Cheapside that I suddenly realised in a couple of weeks’ time I’d be running up this particular piece of road en route to the finish line of the Amba Hotels City of London Mile. Please note the “up”! I’m not quite sure how I’m going to manage to better last year’s time but I’ll give it a go. Very glad to see 100m! Even happier to see the finish! And this year, I didn’t get to run passed Mo but I did see Andy Vernon sprinting for home (well it seemed like a sprint to me!). Unfortunately I was too fast (!?) to see Jo Pavey. One of the pre event stresses was caused by Network Rail deciding yet again to close my usual London terminuses for engineering works so I ended up having to travel to Victoria. In the end, this route worked pretty well and was actually better for the post run evacuation. 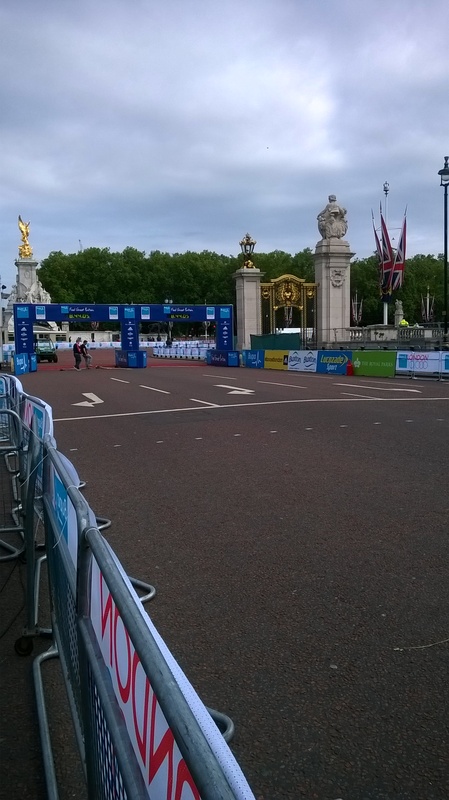 Normally, because the run has an extensive secure area around the Mall, I end up having to circumvent Pall Mall and Piccadilly looking like something the cat’s dragged in and usually end up receiving suspicious glances from guests and doormen at The Ritz. But this year, my walk back to the station was much easier (and shorter) so I might have to consider this alternative route in future. However, as an aside, one of the big questions I’m left with is how come it’s more expensive to spend a penny the further west you go in London? At Cannon Street – free, Charing Cross – 30p, Victoria – 50p!!! How do they justify that? Anyway, my next run is the Harvel 5 on 6 June, an early afternoon jog around Harvel, Vigo and Trosley Country Park which is rewarded at the end by beer, burgers, ice cream and more importantly, cake! I’ll be honest, more often than not I go to parkrun with a “I’ll just enjoy the run this morning, time doesn’t matter” frame of mind and then something seems to take over and I go hell for leather. I have never gone with the attitude of “ok, today I’m going to get a pb”, that’s only ever happened by accident/sheer fluke! But then I don’t think I’ve ever gone with the idea of getting a personal worst either but that’s what happened today and it really didn’t matter, I can honestly say I’m just as happy with that time as with any pbs. 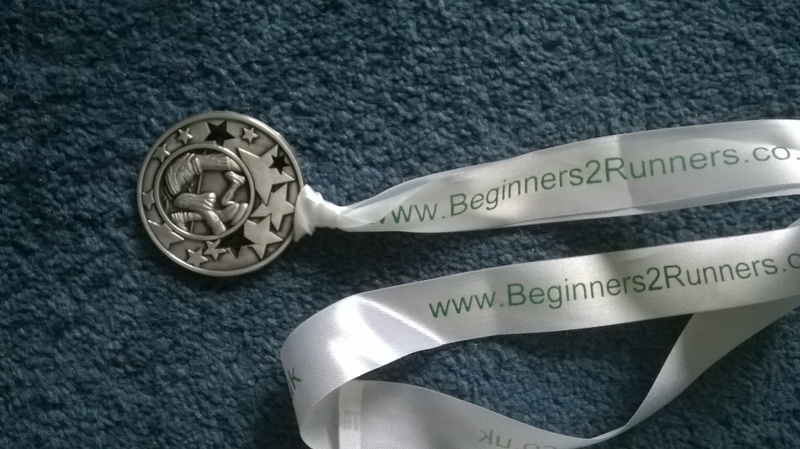 Apart from anything else, I really enjoyed that run – not that I don’t enjoy all parkruns! But this one was so much more relaxed. I wasn’t feeling particularly one hundred per cent, I almost decided against going. As I walked across the car park I fleetingly recalled seeing a prompt in a recent parkrun communication about making sure ICE (in case of emergency) details were up to date on profile pages (note to self – must check that out!). I just decided that if I felt that rough I could always stop. So I started at the back of the field and spent the pre run gathering chatting to another regular about up and coming runs, namely the Harvel 5. I noticed another runner paying close attention to our conversation so asked whether she’d done this run. It turned out this was her first parkrun and she’d only started running a few weeks previously. So the discussion changed to our enthusing and waxing lyrical about the friendly and fun nature of parkrun and reassuring her she’d be fine. She might not have needed reassurance but …. It turned out she’s running a 10k in September so what a good place to get some pre run training! Starting at the back of the pack meant there was no jostling for position and trying to pass other runners at the bottle neck start. The more relaxed pace also meant no thinking “only got to do this bit once more” during the first longer lap; no wondering whether to break into a walk; no thinking “I’ve got to get passed so and so”, just a really pleasurable run around a country park on a Saturday morning. Part way around the first lap I started running with Matt (Gravesend junior parkrun’s Event Director) and his buggy runner partner, Emily, who managed to take off both socks during the course of the run and didn’t complain once despite the bumps and jolts. I was impressed by Matt’s ability to run with a buggy and retrieve said socks, who said men can’t multi task! It was in fact Matt who gave me (unintentionally) the perfect excuse for my more relaxed pace. He asked if I was saving myself for my run on Monday. Perfect, yup, that’s it, just keeping my legs ticking over until then! If only! I think I might have to opt for the more relaxed approach from time to time at future parkruns. It really doesn’t have to be all about going faster. 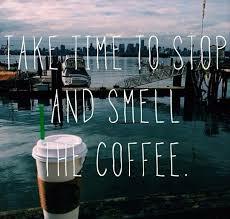 Sometimes you just have to slow down and “smell the coffee”. I would say “roses” but I’ve never seen any roses at Shorne and I know they do coffee! I probably went to this week’s parkrun in totally the wrong frame of mind. After the previous two runs powered by beetroot or placebo, I wasn’t really expecting very much. In fact I was anticipating a much slower run. In the end, I was a wee bit slower than last week but faster than the week before, which suggests that my sudden improvement in times is definitely down to the return to Course A rather than any potential boost from nitrate supplementation. To be honest, I don’t mind, I’m just glad I’m running faster. I did have to smile after the run though. 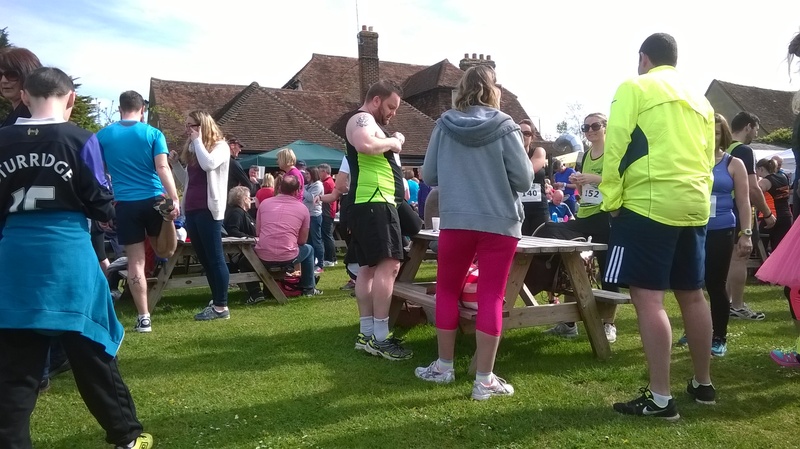 In the post run gathering, it seems that runners don’t ask each other what they’re doing on a Bank Holiday Monday. They ask what run they’re doing! Pre-event gathering in a pub garden! 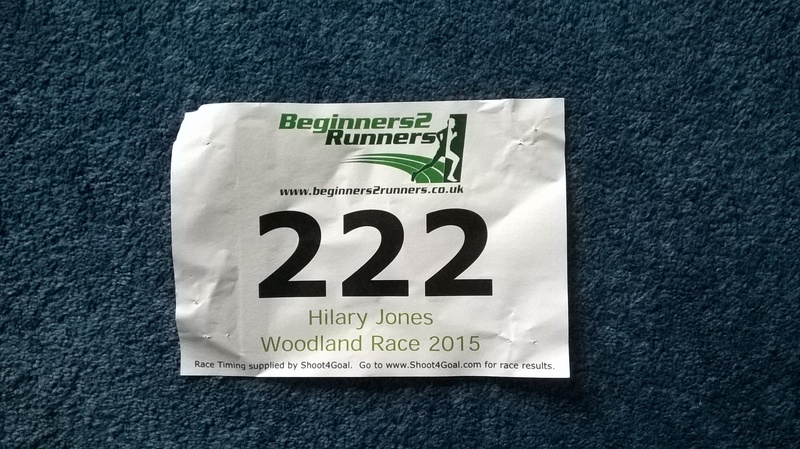 And the run I took part in today was the inaugural Beginners2Runners Woodland 10k run in Barming, near Maidstone. The route was described as multi terrain and undulating. It was certainly that! We were advised that the first 600m was uphill which at least meant no chance of me going off too fast. I kept checking my Garmin to see whether we’d got passed the 600m point. That particular stretch of the route was through (or maybe I should say up) a residential street which meant there were plenty of opportunities to pass other runners but then it narrowed down to a track. I would say that throughout the route and particularly at this pinch point, I found that the other runners were very considerate in terms of making way for (slightly) faster runners. I was a bit dismayed when I came across the 7km marker before the 2km marker. That suggested at some point I’d be running along this path again (I really should have paid more attention to the route map beforehand!). But having survived the first hill, the route did level off and there were quite a few nice declines to make up time. That, however, means only one thing. Especially as the finish was back down the hill we’d run up at the start. Somewhere along the route we were going to have to start climbing again. This started somewhere after the 5km marker and when I came across the 9km marker, I was seriously hoping it was really the 6km marker fallen upside down but no, my Garmin showed me I was being delusional. It was during the first ascent of this hill that I realised some walking was going to be involved in this run. Fortunately, because of the route, the second ascent was somewhat shorter than the first but even so there were three little walk breaks to get me to the top and then I managed a speedy run down to the finish line! At least it wasn’t 666! For an inaugural run, I have to congratulate the organisers. I thought it was very well organised, plenty of communication via Facebook leading up to the event (and after), number collection seemed to go smoothly and the goodie bag was supplemented with a “gottle ‘o geer”. 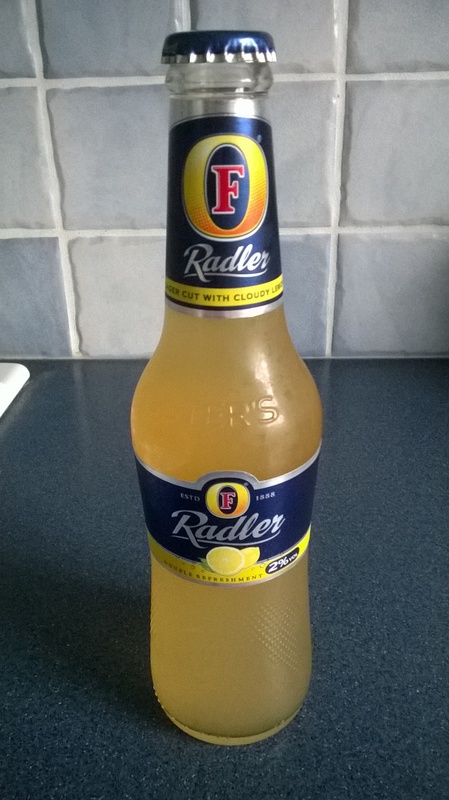 Or in my case, a bottle of Foster’s Radler (lager cut with cloudy lemon). Despite the hills, I would definitely do this run again (after lots of hill training!). Weather – well the rain didn’t materialise, it was actually very warm and the trees were used for shelter from the sun rather than the rain. The scenery out on the course was rural and picturesque but I now have a major concern. As much as I say I would like to take part in the run again, a bit of Googling on my return informed me that Oaken Wood, where much of the run took place, is under threat from a local quarry extension. Unfortunately I can’t seem to find anything on the web since mid 2013 when the extension was given the go ahead. It would be a shame if the area was blighted by such a development but fingers crossed against both that and the run getting at least a second outing. Oh, and to finish my running Bank Holiday weekend, I also submitted my name to the ballot for the London Marathon. So the next five months will be a time of worry about whether I get a place and then fear if I do!